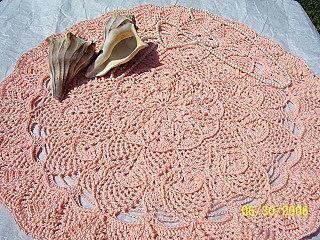 The pattern specifies: Bedspread weight cotton thread (size 10) 350 yards (320 meters) per ball: two balls (the book’s sample was worked in Aunt Lydia’s Classic Crochet, color #424 Lt Peach). 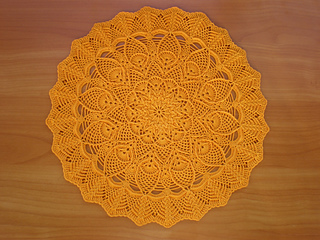 Gauge swatch: 2” / 5 cm diameter: Doily pattern through Round 3. Stitches: Back Post Single Crochet, Back Post Half Double Crochet, Front Post Double Crochet, Front Post Treble Crochet, Back Post Treble Crochet, Split Front Post Double Crochet, Split Front Post Treble Crochet, Front Post Cluster, Cluster, Decrease, DC Decrease. 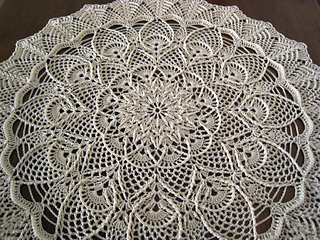 The doily is worked in 34 rounds, and the pattern begins on page 33. 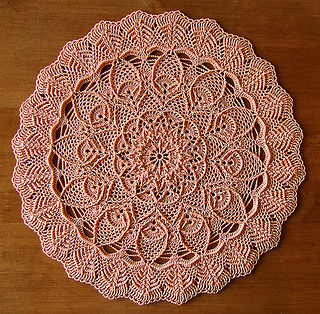 The instructions are verbal; there is no symbol diagram for this doily.